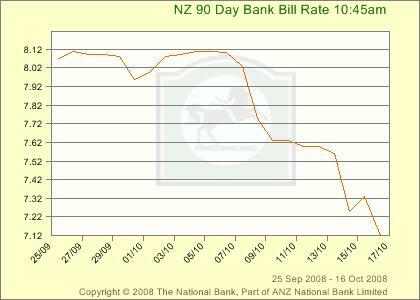 I saw 90 day bill rates rise to 8.1% (from 7.7%) just because of international funding pressures on short-term credit – at least thats what I thought it was. As a result, I felt a 50 basis point emergency cut could be justified. However, the international cuts had already brought us down to about 7.6% that day, and now we are at around 7.1%. This implies to me that the 100 basis points of cuts that are expected next Thursday are also expected to have some bang for their buck – crazy. I did well shorting that one on iPredict. Could not see the sense in the early cut.